The use of BREEAM for underground stations was pioneered on Crossrail. This required the adaptation of theuse of BREEAM Bespoke 2008 methodology to enable BREEAM assessments to be carried out on the Crossrail project works relating to underground train stations (new works and major refurbishments). Crossrail worked together with the BRE to develop a tailored set of BREEAM criteria to facilitate the environmental assessment, measurement and benchmarking of Crossrail’s underground stations at the design and post construction stages of assessment. The resultant tailored criteria set followed the principles of existing BREEAM schemes in terms of structure, content and application (in particular BREEAM Bespoke) yet defined appropriate and consistent assessment requirements criteria for Crossrail’swith underground stations specific critiera. It was only as the methodology was applied that various issues came to light resulting in the further modification and deletion of credits as appropriate such that the criteria evolved over a number of years. Any future projects are likely to use later revisions of BREEAM Bespoke, however, the experience of delivering BREEAM on Crossrail does highlight some of the issues that would be pertinent to other underground stations/structures and this is captured in this paper. In 2009, Crossrail chose to adopt the Building Research Establishment Envrionmental Assessment Methodology (BREEAM), an established third party certified environmental assessment methodology, to evaluate the environmental performance of its new underground stations. It should be noted that although BREEAM had been in existence for some 30 years, it had not previously been used for assessing an underground station and as such its application on Crossrail was accepted as one that required on-going collaboration between Crossrail Ltd as the client and organisation that best understood the operation of the asset and the BRE which needed to ensure the robustness and consistency of the scheme application. Discussions with the BRE established that the use of BREEAM Bespoke 2008 (then the current version) combined with tailored assessment criteria for Crossrail underground stations would be appropriate. The assessment criteria were subsequently developed and finally introduced to the Crossrail project in late 2009. 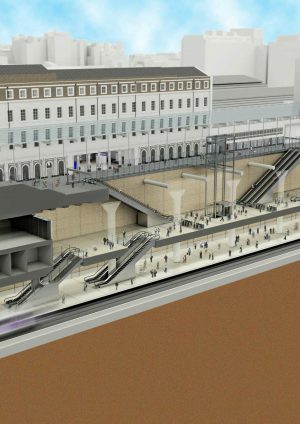 Designs for Crossrail stations had already commenced as part of a Multidisciplinary Design Consultants (MDC) scope to support the passage of the Crossrail Bill through the parliamentary process. Design services were retendered in 2009 as Framework Design Consultant (FDC) contracts with a 90 day acceptance period during which the new design teams were required to undertake a BREEAM pre-assessment, which was later to become the contractual BREEAM rating for Post Construction. The final agreed criteria can be found in the attachment (Version 3.0), although it should be noted that each station is unique in its nature and all criteria were not necessarily relevant to all stations. For example, many credits relate to occupied spaces, however, in several instances the areas designated as Crossrail stations do not have such areas. This can be seen in Farringdon for example where a combined control room is actually located within the existing Farringdon Thameslink station which was not within the scope of the assessment. Similarly this is the case at Bond Street where the control room is within the existing London Underground demise. There has been ongoing dialogue with the BRE as the methodology has been used. These discussions have been of a pragmatic nature and duly considered resulting in appropriate modification or tailoring of credits. Opportunities for enhancing ecology within the scope of the central area stations was extremely limited. At ground level the stations at Bond Street, Tottenham Court Road, Liverpool Street and Farringdon are no more than entrances with “wrap around” over station developments which fall outside of the scope of the assessed scheme and design of the urban realm also outside of Crossrail scope and very much determined by the local authority. Opportunities presented themselves at Whitechapel and Woolwich where appropriately specified sedum will be planted. However, credits LE5 and LE6 implied that credits could be awarded for improvements/creation of habitat at a site remote from the station. The Crossrail project had established a partnership with the RSPB to assist it with its plans to develop Wallasea Island as a wetland bird habitat and provided it with material arising from station excavations to create a specific habitat area known as Jubilee Marsh. Subsequent discussion with the BRE established that in addition to, or where there was no ecological opportunity present at a station an ecologically relevant site remote from the station could be used to demonstrate achievement of these credits provided it could be demonstrated that the credits have been achieved at the off site location. The development of Jubilee Marsh was accepted as a reasonable means to claim the LE 5 and 6 credits for station locations from where material had been taken to develop the Jubillee Marsh site. Given the largely open and unconditioned nature of the underground stations there was initially some difficulty in assessing compliance with Part L of the Building Regulations and achieving an EPC rating. A solution that ignored Part L and adds credits for specific actions (for example, for lighting of a certain average efficacy, or coefficients of performance (COPs) for chilling) an approach similar to that used for international assessments where there is no standard modelling procedure was proposed, but upon consultation with expert groups the BRE advised that the assessment should take place in the normal way, with the accredited energy assessor required to generate the EPC advising on how the EPC would be generated for each station. This was the approach finally agreed for credit ENE 1. Since refrigerants with a low Global Warming Potential/Ozone Depletion Potential (ODP) are generally inflammable they are not therefore compliant with London Underground (LU) standards. This meant that this credit could not be secured on the underground stations. If the stations had provision for chillers and such like equipment to be located externally (for example, on roofs) then this could be circumvented. However the utilisation of the station roof slabs for oversite development precluded this. BREEAM is not about making it easy to achieve credits and the insistence on using low GWP/ODP provides the challenge to operators to seek more environmental benign solutions by working with manufacturers, creating demand and reviewing standards. Underground stations such as those developed for Crossrail have very little conditioned space. This is limited to just a few small back of house areas such as staff rooms, bathroom facilities and control rooms which in total account for <5% of the overall space. These areas are heated by electric convectors and although accounting for a very small percentage of the overall station energy load, resulted in the inability to obtain this credit due to the NOx levels associated with grid supplied electricity. It should be noted that due to safety concerns it is not possible to use gas in this environment, which would allow the credit to be claimed. In a similar vein to that for Pol 1, this throws out a challenge to the industry to seek more energy efficient and cleaner solutions. Could these areas, for example, be heated by waste heat, ground source heat, or renewables? For many years now London Underground (LU) has been challenged by the behaviour of passengers and the poor segregation rates of waste even when LU has provided separate waste receptacles for recyclables at stations. Security concerns have also meant that the provision of multiple collection receptacles requires more vigilance. This has resulted in LU adopting a management approach to recycling that relies on the high recycling rates that can be achieved at modern materials recycling facilities rather than at the stations themselves. LU’s waste contractor is able to segregate and recycle 95% of the incoming waste, and is deemed by LUL to provide an appropriate performance level. However, in order to claim the Wst 3 credit BREEAM has required that the underground stations must provide space proofing for segregated waste receptacles on the basis that a level of futureproofing is required so that separate waste streams can be collected and stored pending collection should behaviours warrant a change of approach from segregation off-site to segregation at source. This was not deemed to be an ideal solution by the design teams given the difficulty in allocating space within the physical constraints of the stations although Crossrail has endeavoured to meet the compliance requirements for this credit where space has been available. Use of natural light is inevitably a challenge in an underground station and this was certainly the case on Crossrail. At Paddington, the design, utilising a large glass canopy over the former Departures Road entrance to the station allowed the provision of daylight down to the ticket hall one level below ground, but this is unusual. Once again this credit sets a challenge for more innovative ways of allowing light to penetrate to below ground levels. Early on in the design stages technologies such as fibre optics with solar tracking light collectors and sunpipes (borrowed light) were investigated. Concerns and limitations were observed in both. In the former, the “tracking device” would need to be roof mounted and as the stations typically had over station developments this was not possible. Also, the technology at that time was limited to approximately 30m of light penetration. Recent research does not indicate any signficnat cost effective improvement on this. For the latter, the space required for the sunpipes was significant and routing these through the oversite development would have taken valuable saleable space. The challenge here is that future underground stations assess the potential to use more daylighting although it is recognised that this may be very location specific. This credit relates primarily to rooms designated as work spaces and in the context of the station environment qualifying rooms are the station operations room(s) where workers are typically undertaking screen related tasks. The credit requires that they are able to essentially defocus by looking into the distance by enjoying an external view. The definition of external is important and in this context a mid/far distance view outside of the operations room was deemed by the BRE to be compliant with the credit requirements, even though that view may be underground. However, the configuration of the below ground spaces did not allow even for this. Earlier adoption of BREEAM may well have highlighted this as an issue and indeed the challenge to the industry is to take this credit into account early enough in the dsign process in order to provide a more positive outcome that would benefit occupant wellbeing. Crossrail initially committed to a post construction BREEAM rating of Very Good based on the pre-assessment ratings achieved. However, the project was keen to keep open the option of achieving a higher rating, or an improved performance within the given rating band provided that overall value could be demonstrated. Within this in mind the following wording was introduced to the Works Information. It is proposed that this could be used as template wording for future projects, or as a basis for an amended form of words. The Client is committed to achieving a BREEAM rating of Very Good for the project The contractor is required to achieve the proposed rating within the agreed budget. Where the contractor identifies that this cannot be achieved this should be notified to the Client/Client Agent who shall instruct the Contractor to revise the design or proceed in accordance with a revised budget. The Contractor is required to identify where it can improve the sustainability of the project through appropriate value management and demonstrate Whole Life Cost benefits within the agreed budget and in so doing identify where individual credits within BREEAM can be improved and/or contribute to an improved overall rating. Where the Contractor identifies that overall sustainability benefits can be achieved by an increase in cost, but in so doing identifies Whole Life Cost benefits this shall also be notified to the Client/Client Agent. The Client/Client/Agents may then instruct the Contractor to proceed on this basis. The Contractor should be aware that a number of credit areas relating to BREEAM require post-construction actions. Where a need for these has been identified through a proposed credit then the Contractor shall make the necessary arrangements for these actions. Where the Contractor has no direct control over any such actions but where they are related to Operational & Maintenance performance, he shall liaise with the designer and supplier/manufacturer as required to ensure that appropriate documentation is provided. Through the design stages the BREEAM assessor was appointed by the FDC. Crossrail took a strategic decision to transfer this responsibility to the contractor organisation once the contracts had been let. In both cases, the BREEAM assessor needed to maintain independence from the design/construction teams. An important nuance in defining the design and construction stages of a project is that rarely is a project handed over to construction as fully designed and detailed. In this example of Crossrail procurements, civil engineering elements were designed to RIBA Stage F, whilst MEP and architectural components were designed to RIBA D/E. The decision to migrate the BREEAM assessor role to the contractor was a step taken to ensure that the contractor organisation remained liable for the BREEAM delivery with the intent that this would create less tension and more accountability in delivery. In some instances these BREEAM assessor services were provided by in-house assessors and in other instances these services were sub-contracted in. Despite alleviating the issue of potential tension between the FDC and the contractor, the relationship between the BREEAM assessors (a contract required position) and the principal contractors was seen to vary depending on their affiliation as did time spent on the project. This highlights the benefit of having a BREEAM AP (Approved Professional) within the contractor team as they can be on call to provide more day to date advice and vigilence over the process. BREEAM (2008) rewards projects that appoint an AP at RIBA B with an innovation credit, but given the decision to use BREEAM was not taken until RIBA Stage C+, the possibility of achieving an Innovation credit for such an appointment was not available to the project. .
A major consideration for such complex projects is the gestation time of projects. In the case of Crossrail the hybrid bill was granted in 2008 and detailed design began in 2009 at which time a commitment was made to use BREEAM (2008). Commissioning of the stations in 2018 is ten years later with subsequent versions of BREEAM reflecting higher expectations on the environmental performance of assets. This raises the question of what do you design for, and is what you have designed and built up to current performance expectations. This is not an entirely unusal scenario for building development and is well recognised, it is just potentially exacerbated during a long gestation period such as that experience in infrastructure construction. Design development of MEP typically continues well into civils construction, and during this time there is opportunity to improve efficiency through dsign but also to procure efficient equipment. These opportunities were taken on Crossrail, and indeed the ongoing dialogue with BRE on the approach to Ene 1 and the operational energy reduction target set by the project meant that energy efficiency was always a focal point. Managing a large project portfolio using the approach adopted by Crossrail demanded significant client management time. Over the 10 year period approximately 30% of one full time equivalent role was dedicated to project management of the BREEAM portfolio. Specific cross-design team workshops examining what BREEAM credits could be achieved were invaluable and were initiated from an early stage. The design (FDC) and construction (Contractor) teams held their own project-specific workshops, however, as the client, Crossrail also facilitated cross-project workshops and specific credit related sessions in order to ensure that learning and best practice were shared amongst the various teams. For example, given the challenge of achieving the desired number of energy performance credits for the stations in particular, required a number of workshops to ensure that energy assessors for each project were taking a consistent approach to evaluating this credit. In general, achieving a level of consistency between the different project design teams was a challenge that was only partially overcome by shared learning. Inevitably there will be some credits that are building specific due to local factors, but it was important to ensure that a consistent approach was taken to common design and architectural elements such as lifts, escalators, cladding, flooring & lighting design. In the latter case, this was recognised by Crossrail early on during the development of a common architectural specification and considerable work was undertaken to evaluate these common elements and calculate their contribution to the overall credit total for the station. These components were assessed by the appointed BREEAM assessor for the common architectural components consultant for their contribution to BREEAM robustness, life cycle and responsible sourcing related credits and provided to the design teams and contractor for inclusion within their overall assessment. Commitment from all parties, client, designer and contractor was necessary, particularly when inevitable programme and budgetary pressures arose. Crossrail did not set any specific contractual penalties for not achieving the Very Good target rating and depended largely on maintaining a level of commitment and motivation across the supply chain to achieve the best possible score within the targeted rating band. Crossrail was fortunate in the main, that its supply chain was committed to this goal, and also a degree of “competitive tension” between contract teams within both the client and contractor teams helped to drive the best possible outcome within the overall constraints. The use of the Performance Assurance Framework [see paper xxxx on the learning legacy), was also very much linked to this. Recommendations have been made within the various sections of the report. As is already widely understood early commitment to the use of schemes such as BREEAM is essential in delivering better environmental solutions whilst minimising cost impact. Keeping a business case focus for credits and capturing this information also helps to build a sound evidence base for future projects. 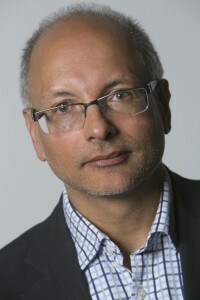 Combining an external assessment tool such as BREEAM with an internal framework such as Crossrail’s supplier performance process which drives other areas of sustainability and wider project performance, can work to deliver better overall outcomes than the use of the external assessment tool alone. Mike has over 25 years of environmental and sustainability design and construction experience much of which has been gained in the rail industry. He has worked on the two largest rail link projects in the United Kingdom, Crossrail and High Speed 1. Mike worked as Sustainability Manager on the Crossrail between 2009 and 2017 and was responsible for delivering its sustainability strategy and reporting as well as leading on CEEQUAL and BREEAM project management, and had an assurance role on the management & measurement of the project’s carbon footprint. He is currently working on HS2 Phase 2b. He is well know in the industry and has published a number of works including the well reviewed Royal Institute of Chartered Surveyors publication “Sustainability & the Property Lifecycle”. He has also sat on a number of working groups including CEEQUAL International, BREEAM Infrastructure and BES6001 a voluntary standard on responsible sourcing of construction materials & products, and is currently on the editorial panel for the ICE Journal, Engineering Sustainability.